Update: Bodog Poker only accepts players from Canada! Bodog Poker, previously also known as Bodog Life, is primary a sports book and also offers a poker room plus an online casino and a horse book. 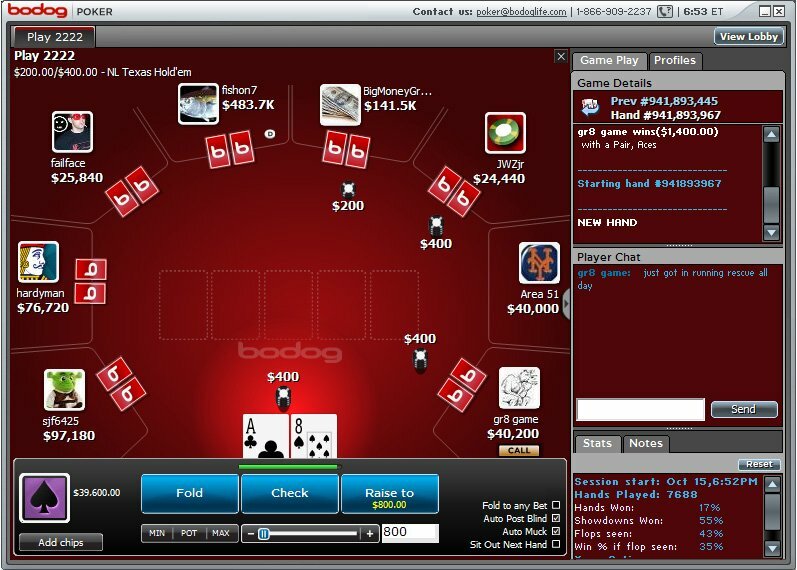 Bodog Poker is on its own network, meaning they don't share players with other online poker rooms. Number wise they are one of the top 15 trafficked sites, which means you will find enough action, about 1500 ring game players at peak hours. Since Bodog's affiliate program has a very strict policy who they allow to promote their products, we're happy to be one those privileged websites. Basically spoken, the promotion of Bodog Poker on Poker Bonus Help is the evidence that we have grown to a respectable poker site with quality and interesting content. 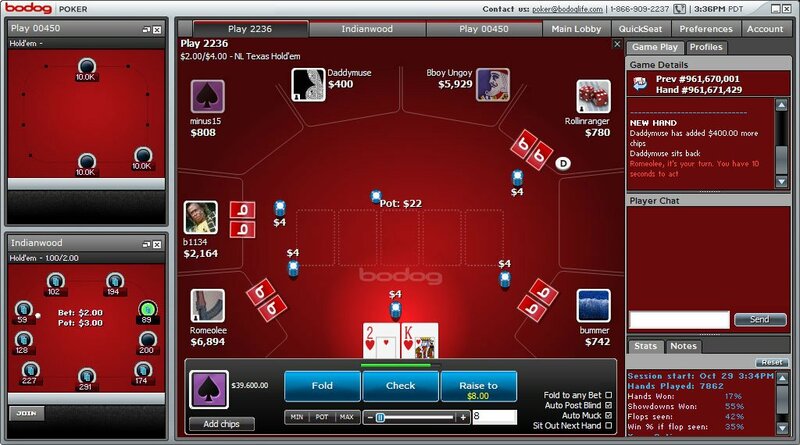 If you're looking for something different than a renowned poker brand, then we can surely recommended Bodog Poker. They are a one of a kind poker room, with quality software and no matter what type of player you are, they have low stakes games, as well as plenty of high stakes games. In the following part of our Bodog Poker review you can read in-depth information about Bodog Poker's client, website, security & integrity, traffic & games, bonuses & promotions and support. As we've already mentioned, Bodog Poker is quite unique. They are on their own network and they have developed their own software. Bodog Poker can truly be seen as a one of a kind online poker room. Sophisticated is the first word that comes in mind after playing at Bodog Poker for a couple of hours. The software looks really sharp and they offer many nice features, including: game details and chat screens which can be detached, well placed action buttons (fold, check, raise - plus the ability to place minimum, pot and maximum bets and a slider to increase bets to a certain amount). You can play up to four tables at once and each and every table can be resized to the size you personally prefer. Bodog Poker's Spotlight makes sure you never lose track of the action. If you rather keep it to one table, then you will be able to view it in full-screen size. Furthermore you can pick a background color to customize the tables as you wish, play with a four color deck, show folded hands, choose an avatar or upload your own and much more. Bodog Poker offers a very interesting sign-up bonus, as you will get a 100% match bonus combined with a 10% upfront cash bonus (which you can use straight away) after making your initial deposit. The match bonus is up to $500 and will be paid at once after reaching the necessary amount of points (10 points per bonus dollar) required to clear the entire bonus. Bodog Poker has one outstanding promotion: Bodog Flight Club. In this monthly promotion, players have the opportunity to win packages to land based poker tournaments and become an official member of Team Bodog. You can buy-in directly to a semi-final (buy-in: $250+20), or qualify your way into it starting as low as $1 or 100 PTS. Besides the low qualifiers, you will find several "last chance" satellites. Live events include WSOP Circuit Events and Main Event, the WSOP and the EPT. More promotions can be found on Bodog.com, just hit Promotions in the main menu. The Bodog brand, including Bodog Poker, is owned and operated by Morris Mohawk Gaming Group (MMGG). They are based in Antigua and are fully licensed and regulated by the Kahnawake Gaming Commission, Quebec, Canada. Just like any other respectable online poker room, Bodog Poker ensures to have taken reasonable steps to keep your data protected. All data transfers between Bodog Poker and users are encrypted (scrambled and protected comparable to online banking), meaning that it can't be read by other parties in between. What's a good online poker room without traffic. Bodog Poker certainly isn't a site with loads of traffic, but you will find a reasonable amount of traffic at the tables on peak hours. They feature a wide variety of poker games like Texas Hold'em, Omaha, Omaha Hi/Lo, 7-Card Stud, 7-Card Stud Hi/Lo and 5-Card Draw, though the most players will be concentrated playing Texas Hold'em games. It really doesn't matter what kind of poker player you are. In fact, with an average of 1200 cash players at peak hours and up to 250 tournament and SNG tables, there's always a table or game that suits your style. The Bodog Poker freeroll tournaments are a great place to start if you haven't started playing for real money yet. They offer two daily $500 freerolls (2:40pm ET and 9:40pm ET) with a reasonable amount of participators - this gives you the opportunity to easily build up a free poker bankroll. We didn't really have to test any of the Bodog Poker support options, since all our tests taken to review the poker room didn't require us to contact them even once, though we did call them to see how quickly we could get connected with a support representative. We got through instantly and we believe that they offer customer support of the highest level, matching all the rest in their company profile. In addition, they advertise to have won several awards for their customer service department. Regular methods to contact the Bodog Poker support team (available around the clock) are available, these include phone and e-mail support.